Derbies, upsets and drama aplenty were crammed into Bundesliga Matchday 29, with changes galore in the race for Europe and the battle for survival. 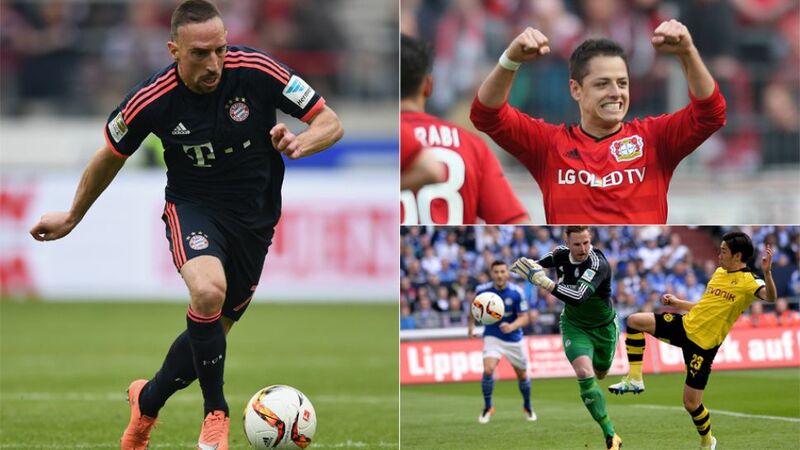 bundesliga.com rounds up the ten major talking points from the weekend's action. When FC Schalke 04 and Borussia Dortmund met in the first half of the season, Shinji Kagawa put BVB 1-0 up, the Royal Blues to equalised moments later and Matthias Ginter restored Dortmund's lead. Their clash on Matchday 29 followed that exact same pattern, and the fact that Klaas-Jan Huntelaar also hit the target meant that three of the four goalscorers from that game on Matchday 12 were on target again on Sunday. This time, however, Schalke will be rather more satisfied with the scoreline; they lost 3-2 in the previous Revierderby.